The nearly $40 million sought by Arizona Gov. Doug Ducey and approved by the Legislature last spring to reward certain public schools for their academic outcomes began flowing this month. 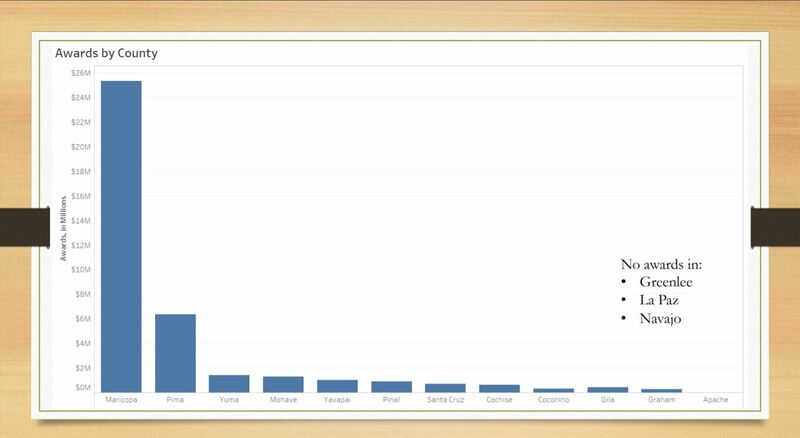 An analysis shows that most schools that received that funding are in Maricopa and Pima counties, serve mainly white students and serve few students with disabilities or who are learning English. A minority of students in the schools that received awards are from low-income families. 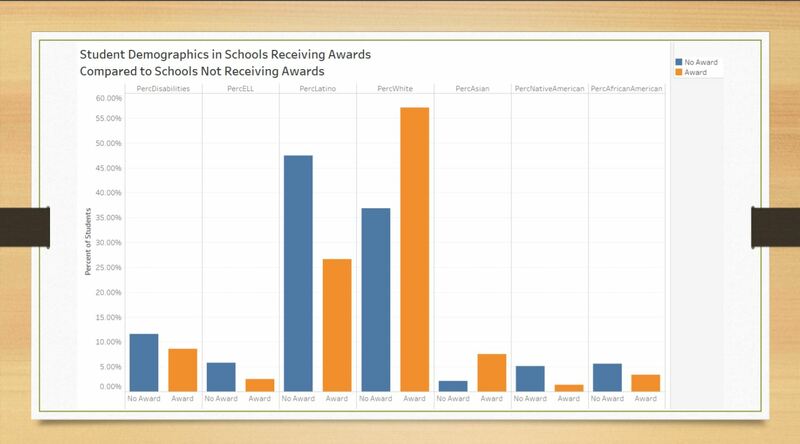 A disproportionate number of the schools receiving awards are charters. The governor proposed results-based funding for public schools during his State of the State address in January, and the Arizona Legislature approved Senate Bill 1530 authorizing it in May. The plan was introduced as a way to expand successful public schools’ reach by providing additional funds for schools whose students scored in the top 10 percent statewide on the 2016 AzMERIT. Despite a model that provided nearly twice as much money for schools with the most students from low-income families, most of the $38.63 million in results-based funding went to schools with the fewest, according to an analysis of the data by Dr. Anabel Aportela, director of research for Arizona Association of School Business Officials and the Arizona School Boards Association. 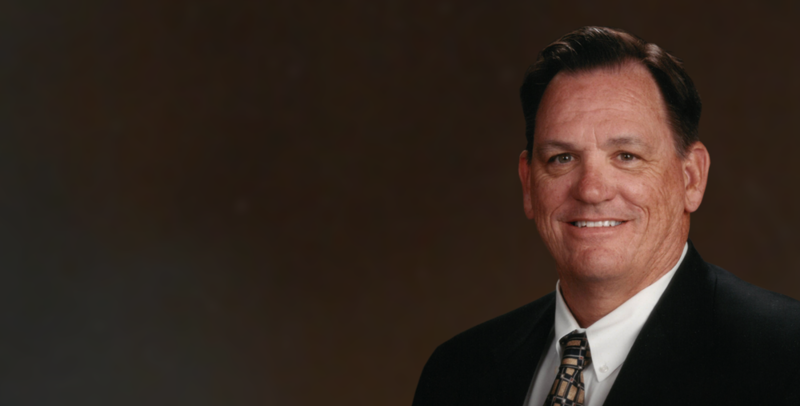 While results-based funding, also known as performance pay, is not new in Arizona, what is new is the attention this plan is attracting from leaders in other states, Aportela said. “I have a colleague at the Education Commission of the States and his job is to keep up with what’s going on in school finance in every state in the country. He told me he’s getting calls from other states wanting to know more about Arizona’s results-based funding to consider whether they want to implement it in their states,” Aportela said. Aportela said, “The research is mixed at best” on whether such plans actually improve performance. 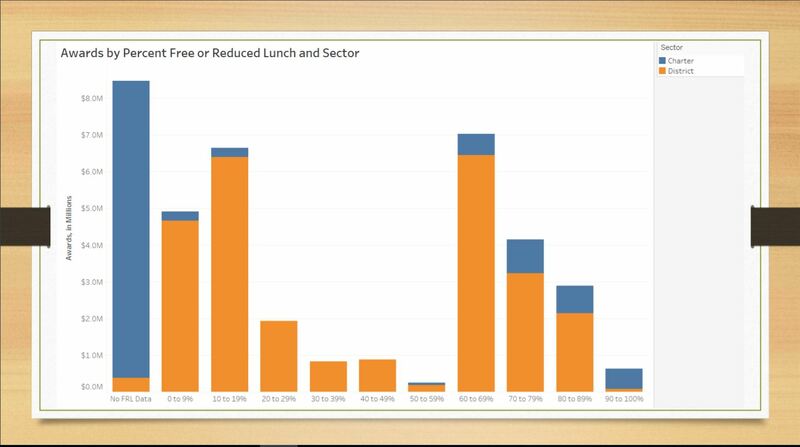 Nearly two-thirds of results-based funding went to Arizona public schools with less than 60 percent of students participating in the federal free- and reduced-lunch program, an indicator of poverty. 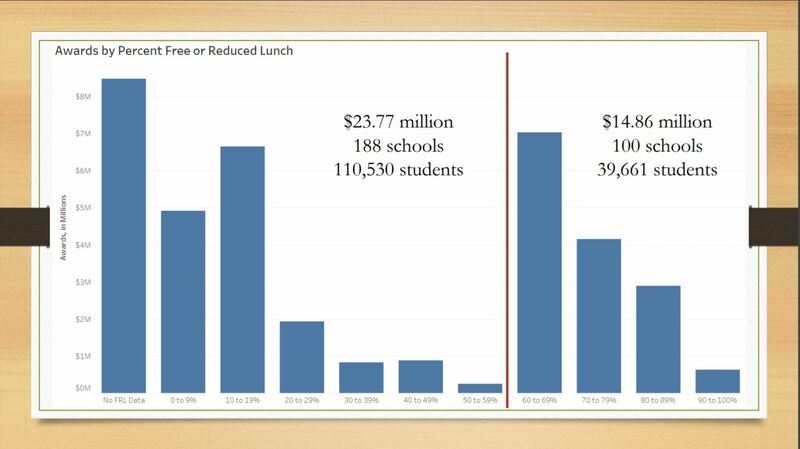 But the actual distribution of funding showed that was not the case, with 188 schools with less than 60 percent of students in the federal free- and reduced-lunch program receiving $23.77 million, significantly more than the 100 schools with 60 percent or more of students in the federal program received $14.86 million, Aportela said. 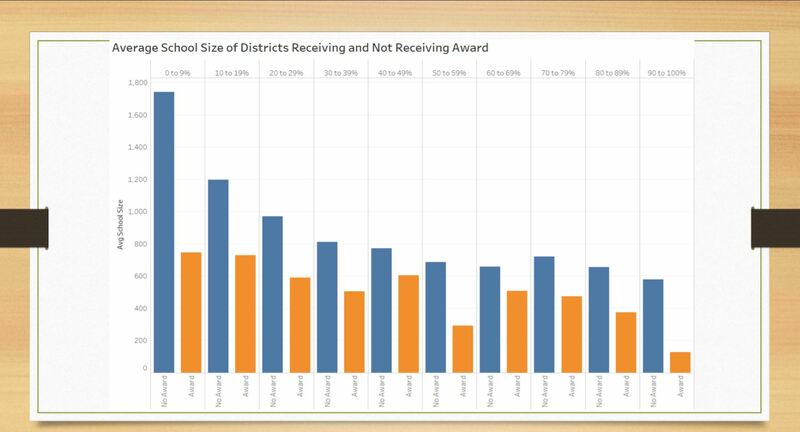 District schools that received results-based funding awards tended to be about one-third the size than those that did not. Most results-based funding went to schools in the Phoenix and Tucson metropolitan areas, and little went to schools in rural areas. Maricopa County schools received nearly 64 percent of the awards, Pima County schools earned more than 15 percent and the remaining 21 percent was split between schools in 10 of Arizona’s 15 counties. 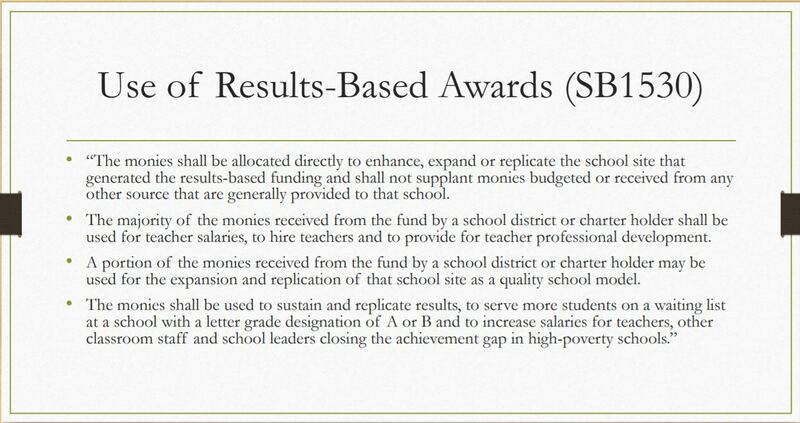 Schools in Greenlee, La Paz and Navajo counties did not receive any results-based funding, while schools in Apache County received just $12,000 in awards, Aportela said. Schools that received results-based funding had more white students and fewer English language learners and students with disabilities. Schools that received an award also had significantly less Latino students and a low percentage of students who are Native American and African American. “The state is more than 40 percent Latino, but only about 25 percent Latino in the schools receiving an award,” Aportela said. 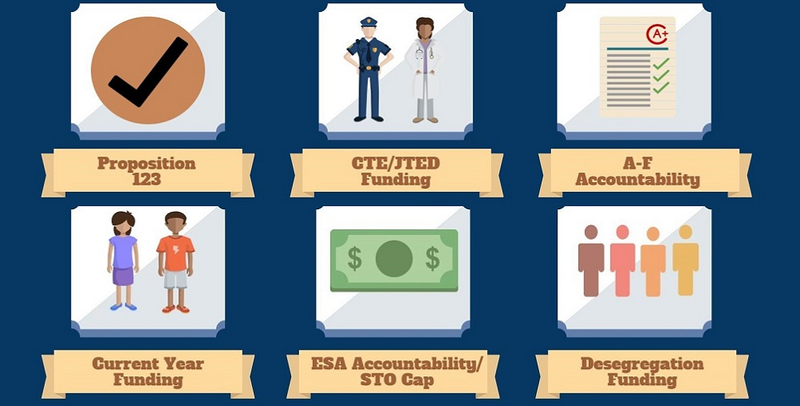 Charter schools received a disproportionate amount of the results-based funding awards. 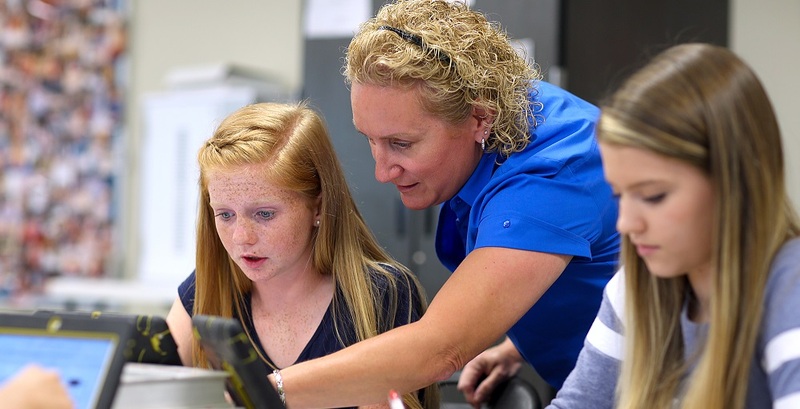 “To give you some perspective, districts enroll about 85 percent of Arizona’s students and they’re receiving 70 percent of the results-based funding. Charters have about 15 percent of students and they’re receiving 30 percent of the funding,” Aportela said. While results-based funding is meant to extend the reach of schools whose students score well on AzMERIT, many schools receiving awards are still figuring out how to use the money, said Dr. Chuck Essigs, director of governmental relations for Arizona Association of School Business Officials. “The most common question is how do they – schools – use results-based funding, because the Department of Education has issued some directions to the schools and said be consistent with the law, but everyone I’ve talked to is having a real difficulty in terms of what does that specifically mean,” Essigs said. 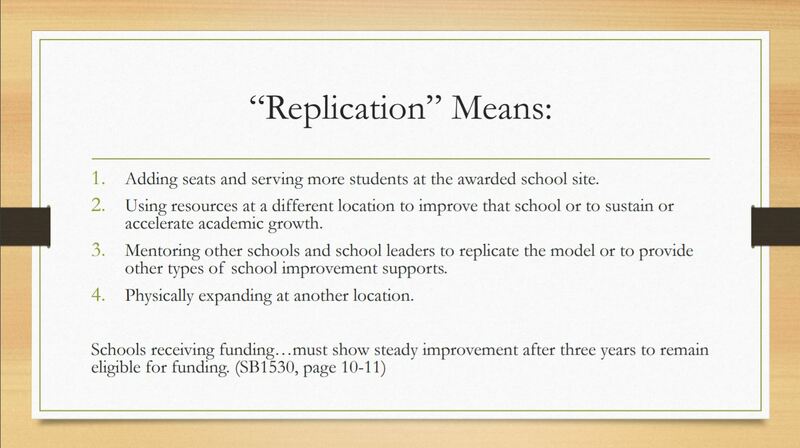 Smaller school districts are concerned about how they can replicate the performance that earned them the award. It also depends on what’s the school identifies that has helped it be successful, Aportela said. There should be some flexibility to take things that are working at one school and replicating it at other schools in the district, Essigs said. Another concern is if there is a requirement for the results-based funding to be spent by a certain time. Receiving this money “after the school year started and after a lot of their employment contracts have been established, it would be difficult to expend all of the dollars in the current year,” Essigs said. The state has let us know that carry-over of funds into the next year will be allowed, Essigs said.